Two-thirds of the 71 companies listed on the World Map of Solar Process Heat Specialists 2017 agreed that achieving bankability for solar process heat projects required huge efforts to be made. They said that key barriers to implementation were a lack of technical expertise in risk assessment at financial institutions and the relatively small investment amounts in individual projects. To rectify this situation, EU project TrustEE is aiming to combine several of industry’s energy efficiency and renewable energy (EE+RE) investment projects into one package to be offered to pension funds and assurance companies. Important financial terms can be found in the glossary at the bottom of this article. Rosenmayr believes that investment packages above EUR 5 million will be an interesting financing option for the TrustEE fund platform. Together with Austrian-based AEE INTEC and German-based Fraunhofer ISE, TrustEE has been focusing on RE+EE projects implemented at SMEs in industry. SMEs are particularly vulnerable to market forces because of high transaction costs associated with their risk assessment checks (also called due diligence checks) and insufficient performance and credit guarantees. TrustEE has called on project developers and turnkey solar thermal suppliers to suggest proposals for consideration by the EU project. But TrustEE also looks at the industry’s stock market-listed businesses. Regarding this target group, the approach is to isolate EE+RE investments from the usual system costs to achieve a balance sheet-neutral outcome. This is where energy service companies (ESCOs) come in. Letting an ESCO run EE+RE measures over time means they can be distinguished from the production plant investment. 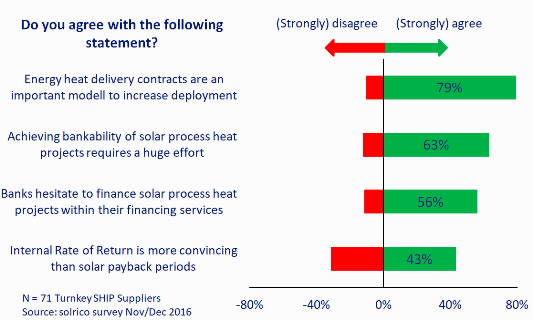 The chart above shows that 79 % of the turnkey SHIP suppliers on the world map believe in heat supply contracts being an important model to increase the number of solar heat projects in industry. Rosenmayr is planning an assessment of the first RE+EE projects by the end of September and will present its outcomes at the Alpbacher Finanzsymposium (4 to 6 October 2017) in Austria during a 1.5-hour session dedicated to strategies for de-risking and financing EE+RE projects in industry. A key performance indicator (KPI) is a measurable value to demonstrate the financial attractiveness of an investment. The net present value (NPV) is used to analyse the profitability of an investment. The NPV shows the difference between the present value of positive cash flows (earnings) and negative ones (financial and O&M costs) during the operating lifetime of an energy-saving measure. The internal rate of return (IRR) is a method to measure the profitability of investing. The IRR sets the NPV of all investment cash flows (positive and negative) to zero. the solvency of the turnkey supplier or ESCO is guaranteed throughout the operating lifetime. The Securitisation Law offers globally accepted financial guidance on evaluating and reducing risks in financial transactions or debt financing.